Looking for a complete solution for redness-prone sensitive skin? 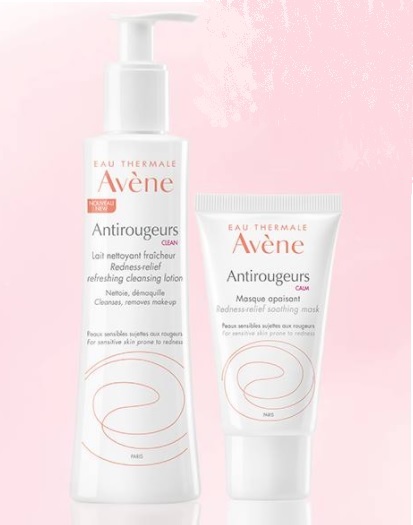 Avène introduces a new and improved formula for two of the products in their Antirougeurs line of skin care - targeting rosacea, flushing and signs of redness. Cleanse and mask with a fresh and gentle texture that quickly soothes and reduces the skin's tightness. 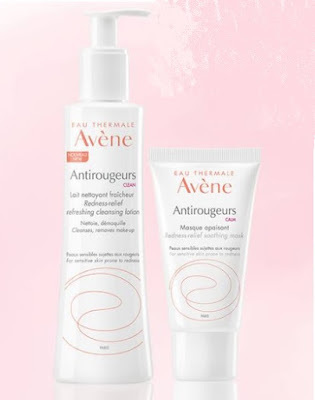 Both products are fragrance, alcohol and paraben-free and contain a minimum of 80% of Avène Thermal Water to provide even more instant soothing freshness and softness. Antirougeurs Refreshing Cleansing Lotion - 200ml - $24.50 - with an optimal smoothing action and a cushion effect to protect the skin from friction and provide effective and gentle makeup removal. Antirougeurs Redness-Relief Soothing Mask - 50ml - $36 - gentle but controlled distribution for targeted action on redness it soothes with a high content of 81% Avène Thermal Water and moisturizing thanks to an hydra-nourishing complex which combined with plant-based glycerin helps retain water and bring nourishment and comfort to the skin. Avène Couvrance Green Concealer Stick - $20.00 - seamlessly neutralizes and covers redness with a water, transfer and sweat-resistant formula that is fragrance, preservative and paraben free. My best tip for using a green concealer, don't apply it directly to the skin but rather mix it with a bit of concealer first and then apply - it's really hard to cover a patch of green on your face - you either rub it all off when you apply the concealer on top or don't cover it entirely and end up looking part frog. Available at drugstores across Canada and online at beautyboutique.ca.